The Scottish novelist John Buchan is the writer about whom I know the most. I‘ve been reading him, and working on him, on and off, for over twenty years. But I get bored with his most famous character, Richard Hannay, and with The Thirty-Nine Steps, which is his most famous novel. So, here’s a Buchan novel that isn’t about Richard Hannay. The Gap in the Curtain (1932) is a great read, for several reasons. It’s narrated by Buchan’s other great protagonist-narrator, Edward Leithen, who is a hard-working lawyer and politician. He has nothing to do with the secret services, nor does he take orders from the Foreign Office or the police: he is an independent adventurer. 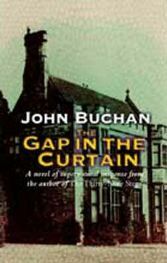 The Gap in the Curtain is a collection of short stories masquerading as a novel, and I like this too: Buchan’s short stories are always excellent, since they are tiny portraits of a particular activity or specialist knowledge, but when they are linked to each other, there is an extra layer of satisfaction. This book is speculative fiction, a change from the relentlessly physical adventuring that Hannay tends to do, and a form of writing that Buchan doesn’t get enough credit for. The stories are set in Buchan’s alternative political universe, where he shows off his enjoyment of politics as a game of tactics. Leithen is not a showy hero, but is, surprisingly, the most frequently occurring character in all of Buchan’s fiction. He is an earnest voice of reason, a substitute for the ordinary man, and takes us into extraordinary adventures, quite often involving introspective subjects. He overdoes things, frequently, and in The Gap in the Curtain he is practically dead on his feet from overwork. His concerns are also low-key, being about the lives of people, rather than the fate of governments. Buchan used Hannay for big diplomatic problems where nation was squabbling with nation. Leithen was Buchan’s way of exploring human nature, and the resilience of the human spirit. This small-scale, human scale of the Leithen stories makes him a very attractive character, for all his professional importance. The short stories in The Gap in the Curtain are the linked adventures of professional men who have been given a glimpse into the future. A stockbroker chases all over the Near East and southern Africa to buy shares in a mining concern that only he knows will be big money in a year’s time. A politician has to juggle his party affiliations to end up on the right side of the man who he knows will be Prime Minister in a year’s time. I really like the way Buchan handles the speculation in these stories. Since Buchan was also a member of government and the Establishment, he is writing from life, and makes a plausible alternative universe for us. Plausibility is important, because we need to believe in their position in the world to feel the necessary fear as they encounter socially risky situations. Buchan was extremely good at convincing the reader of totally invented facts. Watching him do this, experiencing the suspension of disbelief, is to observe a master craftsman at work. Buchan blends the social effects of the First World War into his fantasy to work as a kind of baking powder of realism, so we can swallow it happily. In The Gap in the Curtain Sally is having a weekend party at her country house, and many of the guests are exhausted. She has also invited a famous professor who has invented a way of seeing into the future, and wants to try this out on other people. So the exhausted guests go through exercises and training, and finally they see into the future. They see a brief glimpse of the front page of The Times, a year ahead, and – most importantly – see something that directly concerns them or their professional lives. The banality of seeing a newspaper front page is part of the baking powder of realism: we all know (or Buchan’s original readers would know) what The Times looks like. The front page of a newspaper is a commonplace and ordinary fact of normal life, and long may it stay that way. By blending this normal experience with the supernatural experience of seeing into the future, and knowing that it is the future, Buchan makes us accept the whole thing without thinking too much about it. Disbelief is suspended so we can find out what happens next. But this premise sets up rules for each character’s situation. Obviously they can’t tell anyone else about their secret knowledge, because they wouldn’t be believed, or they’d be called mad. At best they would be laughed at. This risk of derision won’t do for heroes, because Buchan’s five characters who undergo this experience are definitely heroes. These stories are about the triumph of the human spirit over nature, and so they must be noble, heroic, brave, determined, all that stuff. Leithen also saw a glimpse of his future but doesn’t act on it: thus he is able to narrate the novel. Within the logical premise of the plot, all is good so far. Characters A and B act on their foreknowledge, and are misled by their own assumptions. Their intentions go awry because you can’t cheat fate. Character C is the light relief: he makes a false assumption and does indeed do what his foreknowledge told him he would do, but without wanting to do this at all. Once again, you can’t cheat fate. Characters D and E see their own obituaries, so we are taken through an intense examination of how the human psyche copes with a presumed certainty of death in the near future at a specific time. But here Buchan breaks his own rules, by using a mistake in the interpretation of the foreknowledge for one of the doomed characters. One of them dies, but the other doesn’t because someone else with the same name does instead. However, the experience of coping with foreknowledge is the focus here, and Buchan cranks up the tension pretty powerfully, since we have no idea how fate can possibly be cheated. Thus we see that the rules of speculative fiction need to be obeyed to their logical conclusion, or else the story suffers. A final reason for liking this book so much is that Buchan stretches himself, he’s having a go at a kind of science fiction that he would have known from H G Wells. He may not be doing it quite right, but his experimentation has produced a great book, and opened up a new kind of Buchan’s writing for the Hannay-addicts. No Comments on "The Gap in the Curtain"